Because of my school schedule, I’d arrived home at the beginning of June as opposed to mid-May; thus, I had missed multiple opportunities to catch up with friends whom I had so dearly missed. Thankfully, this cake went over well with everyone in attendance at the picnic I brought it to, with one friend even proclaiming that it was the best cake she had ever had. I can’t say much about that, but I think the real trick to making this cake was to bake it with a good friend (who is exceptionally intelligent and talented at cooking and is probably the real reason this cake looks and tastes presentable), finish at about 9 p.m., and then talk until 4 in the morning. It makes it extra special. 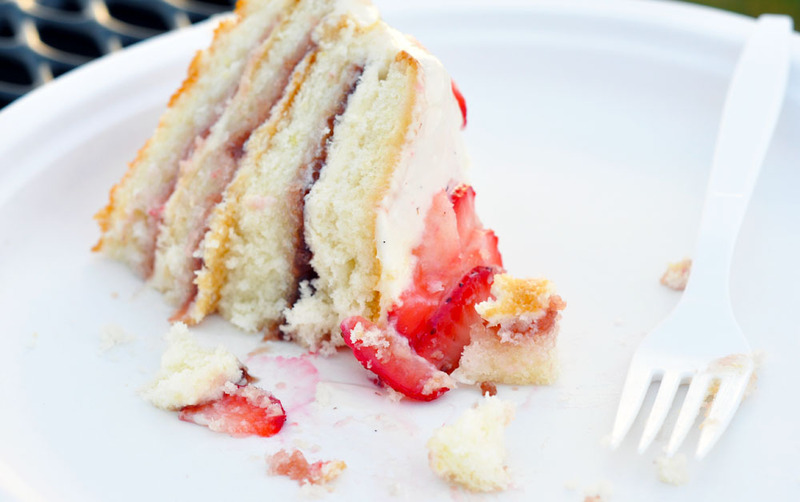 Either way, the result was a mesh of flavors that I think truly made a perfect birthday cake. Center a rack in the oven and preheat the oven to 350 degrees F. Butter two 9 x 2 inch round cake pans and line the bottom of each pan with a round of buttered parchment or wax paper. Put the pans on a baking sheet. 1. Sift together the flour, baking powder and salt. In a separate, medium-sized bowl, whisk together the milk and egg whites. 2. In another bowl, place the sugar and lemon zest and rub them together with your fingers until the sugar is moist and fragrant. Add the butter and beat at medium speed (if you have an electric mixer; you can also do it by hand) for a full 3 minutes until the butter and sugar are very light. Beat in the extract. 3. Add one third of the flour mixture, still beating. Add in half of the milk-egg mixture, then beat in half of the remaining dry ingredients until incorporated. Add the rest of the milk and eggs beating until the batter is homogeneous, then add the last of the dry ingredients. Continue beating for another 2 minutes to ensure that it is thoroughly mixed and well aerated. 4. Divide the batter between the two pans and smooth the tops with a rubber spatula. Bake for 30-35 minutes, or until the cakes are well risen and springy to the touch – a thin knife inserted into the centers should come out clean. 5. Transfer the cakes to cooling racks and cool for about 5 minutes. Run a knife around the sides of the cakes if needed. Invert and cool to room temperature, right side up (the cooled cake layers can be wrapped airtight and stored at room temperature overnight or frozen for up to two months). Beat the cream cheese until smooth. Add the sugar and beat until light and fluffy; scrape down the sides and beat in the vanilla extract. In a separate bowl, beat the whipping cream until soft peaks form; gradually fold the whipped cream into the cream cheese mixture and squeeze the lemon juice into the mixture. Cream together the cream cheese and butter; mix in the vanilla, then gradually stir in the confectioners’ sugar. Squeeze the lemon juice into the mixture. Using a sharp serrated knife and a gentle sawing motion, slice each layer horizontally in half. Put one layer cut side up on a cardboard cake round or a cake plate protected by strips of wax or parchment paper. Spread with one third of the preserves. Cover the jam evenly with about one-third of the cheesecake filling. Top with another layer, and repeat. 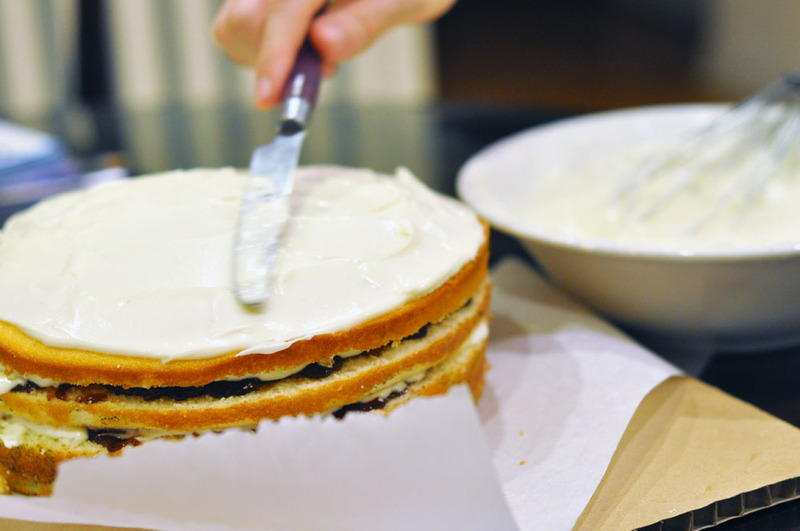 Place the last layer cut side down on top of the cake and frost the cake with the cream cheese frosting. 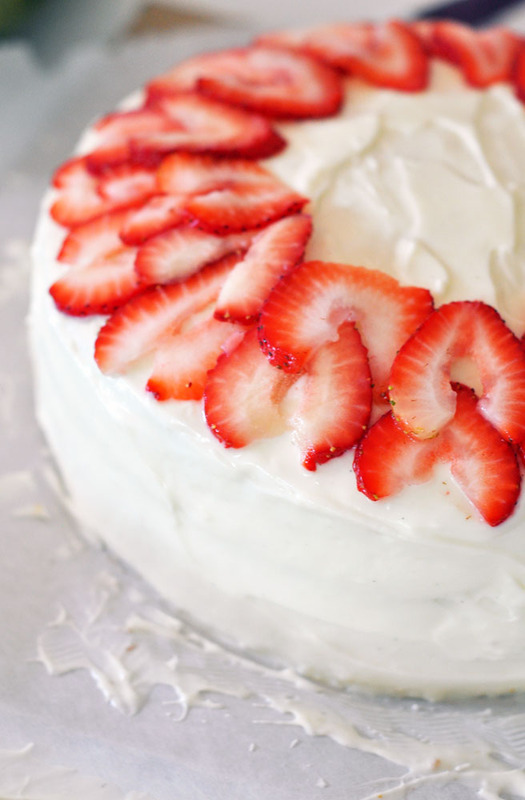 The cake is best the day it is made, but you can refrigerate it, well covered, for up to two days; just bring it to room temperature before serving. If you are freezing the cake, slide it into the freezer to set, then wrap it really well – it will keep for up to 2 months in the freezer; defrost it, still wrapped overnight in the refrigerator. I’ve been lookin for a cake to make for my daughters 5th birthday. I think this could be it! Thanks for sharing. 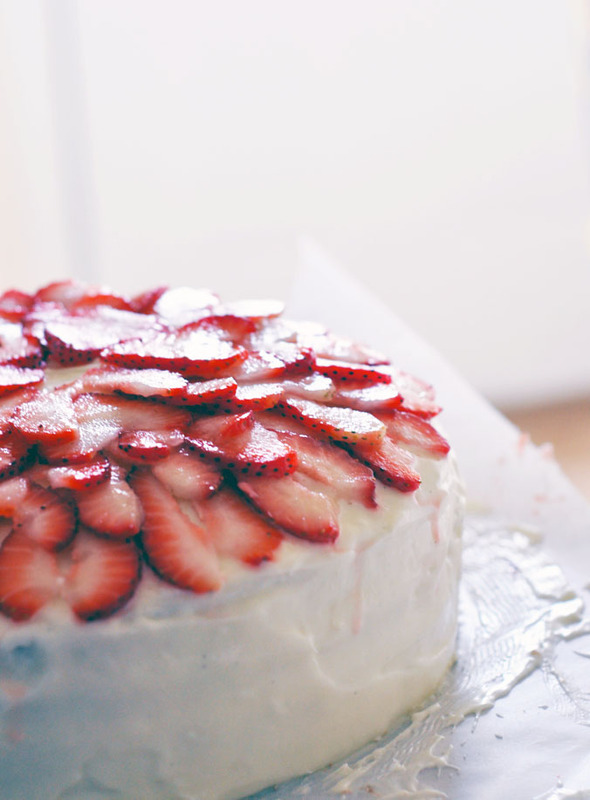 Oh lordy those beautiful strawberries and the cream cheese icing and filling sounds stunning together. Cheers for this! Annieeeee this makes me want to lick my computer screen!